So I am now coming to the close of my third week going gluten free in Hong Kong. I wanted to take the time this week to outline a few themes that have made themselves more clear for me this week as I am now starting to become much more familiarized with the gluten free lifestyles in Hong Kong. I would like to take the time to talk about the the three themes I have become most aware of this week: avoidance, weight loss, and language barriers. After this I would like to share a few good eats I have came across over this week's gluten free voyage a restaurant dish, a grocery shop find, and lastly a personal recipe I have that is likely familiar to most of you but has become a sort of staple food for me lately. Since taking on the diet I have noticed most prominently in my behavior, that of avoidance. Some days.. most days.. I am much too exhausted with my busy schedule to really take the time to go probing new spots to try and ascertain whether or not they might offer gluten free. Instead many times I stick to set habits and places I know can offer me gluten free options. I understand that for a coeliac living in Hong Kong they must be caught in a sort of repetition similar to my own, this probably makes it rather difficult to explore the city and find new spots. It's a bit dismal to think that a dietary restriction can really limit your mobility and freedom at most times. Though not as large as I would have expected, an element of social avoidance has been present. There were a few times over the week where I had to decline offers to go get pizza or burgers because they had gluten in them. Though some social situations were avoided or declined, others were able to be modified. For instance, I was asked to join a friend for Chinese food and instead I suggested we go to Little Burro where I was able to eat a gluten free burrito bowl. This way I didn't have to neglect my social obligations but could still adapt to my diet. However, when large groups were planning to go to a gluten latent establishment I felt forced to politely avoid the outing. I now see why someone with coeliac or an extreme gluten allergy might prefer to exclusively spend time with others on the same diet, forming a sub culture. I didn't particularly expect to lose weight on my gluten free diet. This is because I have been pretty care free about other elements of my diets which I had previously been more restrained in. For example I used to eat meat very sparingly, but since beginning my diet I have more liberally consumed; this is also true for other foods such as rice, sugar, and dairy. The stress and logistical difficulty of eliminating gluten has made me feel much more willing to eat whatever foods are immediately available to me. Though I wouldn't say I feel like I have dived over the deep end, at times I eat things I previously wouldn't have. This is somewhat balanced by the fact that I now cook more and the things I do prepare are relatively healthy. The past couple of weeks though about 5 coworkers and friends have commented on the fact that I appear to have lost weight. I myself was not aware of this so I was a bit surprised. I would attribute my weight loss to two factors: a lack of carbohydrates and a lack of food in general due to limited food options. Though I am still able to eat rice, I have of course been unable to consume bread and most pastas. Carbs of course are the main things that cause use to gain weight, so I am sure decreasing this has led me to lose some weight. Additionally there have been times that I was unable to eat at all. When I poorly planned and couldn't find any options around this was unfortunately the case. At these times I felt extreme fatigue and irritation, and I am sure I also lost some weight as a result. I plan to purchase a scale this week so that I can track my weight loss more precisely. For those of you living outside of Hong Kong, it is important to note, this city is incredibly English speaker friendly. Unlike other cities in the mainland China or in Japan most citizens of Hong Kong can speak enough English to make everyday tasks moderately easy for English speakers. I have perhaps never relied on my virtually nonexistent Cantonese speaking abilities to complete everyday task. Therefore, becoming gluten free in Hong Kong presented me with a situation through which language barriers became increasingly prevalent. Though many local restaurant workers are able to converse in the basic English needed to take down an order, nearly all of them were unable to understand the word gluten. Therefore, it became impossible for me to communicate my dietary need. This further enhanced my avoidance of the more local eating establishments because I knew there would be no way possible for me to bridge this barrier. It was only when dining out with Cantonese speaking friends who understood gluten free diets that I was able to enter such restaurants confidently. This further supports the claim that gluten free eaters will not be able to get the authentically local experience of Hong Kong, as food is one of the key elements in experiencing a new culture. So this has been the three themes I became most pertinently aware of in gluten free dieting this week, I hope to shed light and share more next time. I find it especially useful to my social research to pin point these themes and share them with others on the diet, in hopes of getting their feedback and really getting to the core of the gluten free lifestyle in Hong Kong. 1. 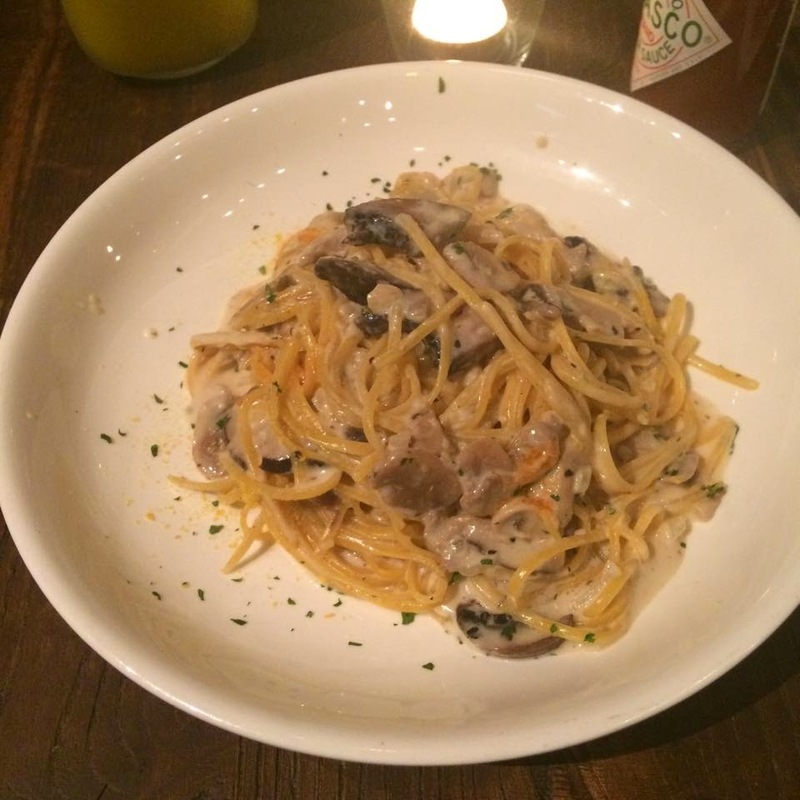 Restaurant Dish: Locofama's Mushroom Linguine. I do apologize for the photo as I had started to eat early so it doesn't look attractive per se. However, the pasta was a very nice texture and the sauce was exquisite. Locofama is an organic foods restaurant located in Fuk Sau Lane, off of Third Street in Sai Ying Pun. I highly recommend this restaurant if you are a gluten free eater as they have many GF options and understand what GF is etc. You should also try their neighbor, Grass Roots Pantry, which is also a great GF organic and vegan eating option with an excellent dessert menu. I am quite lucky to have these two restaurants in my backyard. 1. My Own Recipe - Guacamole: As do most Americans, I absolutely love Mexican food. I am not the best cook out there but I do make a killer batch of guacamole. I really recommend this for anyone, gluten free or not, it has always been a hit when I bring it to parties. 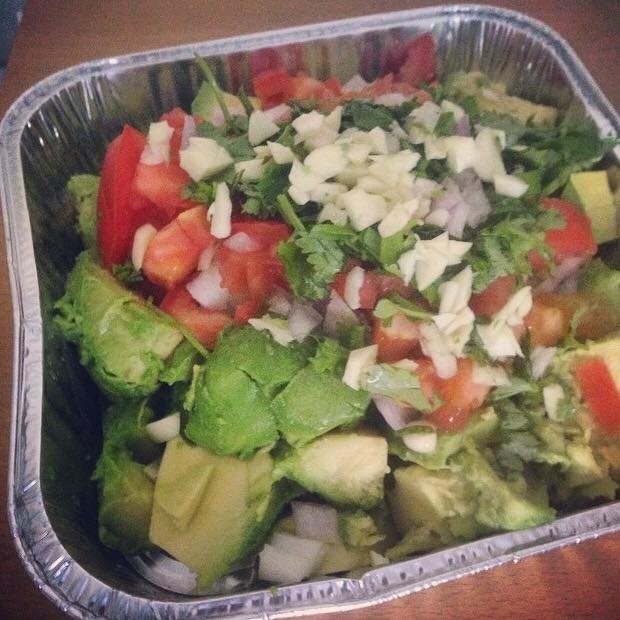 Ingredients: 3-5 avocados, 1-2 cloves of garlic, 1/2 red onion, coriander, 1-2 tomatoes, salt, pepper, lemon and Tabasco. Chop the avocados, garlic, coriander, red onion, and tomatoes. Mash together and stir, squeeze the lemon over the batch, then add salt pepper and Tabasco to your liking. This is a very simple recipe and you can experiment with the portions according to your taste preferences. I guarantee you will love this. 3. 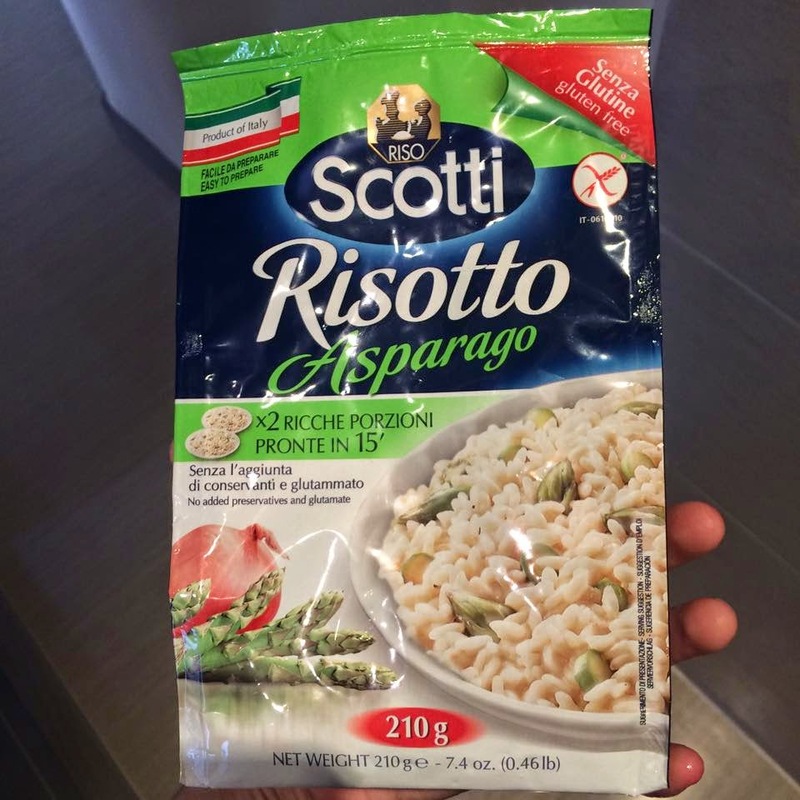 While short on time and struggling to find my next lunch option at the grocery store, I came across this amazing gluten free Italian Risotto. I was struggling to read the italian ingredients and pretty sure this would lead to another disappointment, when I noticed the red triangle in the corner of the packaging reading "Senza Glutine", or gluten free in Italian. This was a great surprise, at a very affordable 38HKD this Risotto is very easy to make and has a nice flavor. Would recommend it for the less talented gluten free cooks out there - makes eating in simple, affordable and pretty good for taste. Thanks for reading all, see you next week!